For those sufficiently well heeled and able to track one down, the F-30CE Cocobolo is pretty much as good as fingerstyle guitars get. Exceptional fingerstyle tone. Clean looks. Top-drawer finish. A little heavy. Having to send it back, a cliché but it's true. Guild has been building guitars since 1953 and its F-series guitars (fingerstyle/folk) have proved to be flagship models. In 2011, Guild Guitars staged a showcase event for European dealers. Only those attending the event could stock these unique GSRs, Guild Special Runs. Fender GBI selected two guitars, a D-40 Noir and a F-30CE Cocobolo (reviewed here), and duly dispatched them to us for evaluation. One of the few things those two guitars have in common is the D-TAR (Duncan Turner Acoustic Research) Multi- Source pickup, a unit that combines the Wave-Length undersaddle system with a condenser microphone. The Multi-Source system starts with the Wave-Length unitary design, piezo, co-polymer, undersaddle pickup, which is coupled to an 18-volt, low-noise, high-input impedance preamp. "Seated just inside the lip of the soundhole is the omni-directional condenser microphone"
The pickup itself is wrapped in copper shielding. D-TAR claims running the system on 18 volts (which is achieved with a voltage power booster) provides twice the dynamic range of a typical nine-volt system. This is because the additional voltage gives the signal more headroom, removing 'quack' when strumming or picking with gusto. Changing the two AA batteries is no easy task. The cells are housed within a casing that sits inside a fabric 'pocket' attached to the inside of the neck block with Velcro. We couldn't access the batteries without slackening off most of the strings - annoying. Seated just inside the lip of the soundhole is the omni-directional condenser microphone. To isolate it from unwanted vibration and handling noise, the microphone is embedded in a shock mounting. Interestingly, the mic signal has two stages of frequency roll-off, which work together in order to combat internal microphones' tendency towards low-frequency feedback. Low-profile rotaries fitted just inside the upper bout side of the soundhole control master and mic volume respectively. If you're used to reaching for a shoulder-mounted control panel, rotaries located inside the soundhole can be fiddly to use, not least because they're situated so close to each other. Adjustments mid-song, say for a solo, can be very tricky. That said, it's a good thing that such a high-end guitar has not suffered intrusive surgery to accommodate a control panel. The F-30 has long been one of Guild's most popular small-bodied guitars. Launched in 1959, the F-30 quickly became a folk favourite. Our review model ups the ante somewhat, featuring a solid cocobolo back. Cocobolo is an oily, tropical hardwood found mostly in Central America and, because of its inherent strength, is often used for gun and knife handles and police batons! Bass guitar manufacturer Alembic is credited with pioneering its use as a tonewood and, famously, Stanley Clarke's signature tone was attributed to using basses made from cocobolo. The F-30CE's decorative cupboard is not exactly over-stocked, but an ornate centre strip of parquetry sits between what is a sumptuous selection of bookmatched cocobolo. "The F-30CE purrs with rich, complex overtones and sustain to boot"
The F-30CE's top is constructed from Carpathian spruce, which boasts a tight, almost ruler-straight grain. Simple black coachlining and ivoroid binding follow the sweeping lines of the F-30CE and a five-ring soundhole rosette includes an abalone strip. The Martin-esque bridge is ebony and home to bone Parisian eye-topped bridge pins. The ivoroid bound, three-piece, slim-profile mahogany neck features a walnut 'skunk stripe' centre strip while the headstock possesses a cocobolo faceplate. The F-30CE is tastefully bedecked and the use of exotic woods creates an aura of class and style. The only slight negative construction-wise is the weight of the guitar. It's clear, though, that quality control is exceptional: the scalloped Adirondack red spruce bracing is smoothly sanded and imperceptibly glued in place, while the gloss finish is impeccable. The F-30CE is a fantastic fingerstyle guitar. Offering an airy, smooth timbre, the F-30CE purrs with rich, complex overtones and sustain to boot. The full output results in a less-is-more approach to playing and it seems somehow irreverent to give the F-30CE a thrashing with a heavy pick. The lower registers possess strength and presence without a hint of boom, and the mid and top end boast warmth while retaining clarity and sharpness. 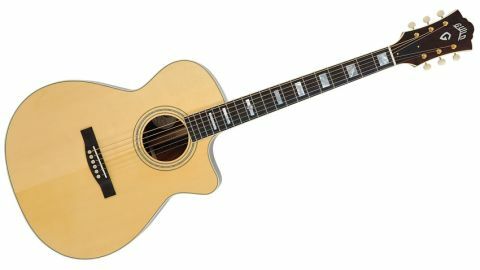 Plugged in, the D-TAR system performs admirably and offers a very credible reproduction of the F-30CE's acoustic tone. The mic blend control has more influence on the output and this provides greater versatility in the amplified tone. The depth and character of the originating acoustic tone results in keeping the amplified version from sounding thin and nasal. Overall, the F-30CE's sonic performance is impressive, whatever the setting.